Caught in a dreamscape, mistaken for a killer ... will Alice find a way home? 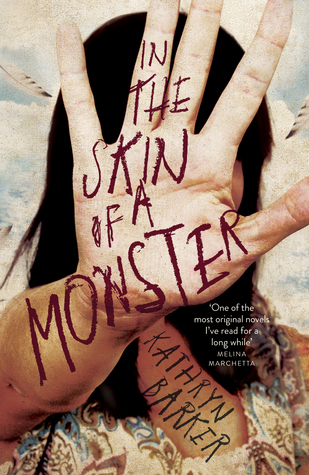 In the Skin of a Monster is stunning, deliciously off-beat and totally absorbing. Completely unlike anything I was expecting or have read before and, even once I found my footing and got into the groove of the world, Barker still managed to twist things around until I was left with an unexpected lump in my throat and tears down my cheeks. I didn’t read the blurb of this properly (common habit with me, I skim and dive in). I thought this was a contemporary novel -- but it’s a more genre-defying, drums-along-to-it’s-own-beat kind of book. I often struggle at classifying books but I would say this is fantastical while also having a contemporary reality mingled in. The novel is mostly set in a dreamscape -- in a town identical to the real-life Aussie outback country town, but this version is where the dreams the people in the town dream at night come to life. Like in a dream, things seem similar but are a bit off kilter. And, in this town, a lot of the people have been having nightmares... making the dream world ever-deadly. Confused yet? Ha, well, that’s part of the appeal. Starting this book felt a little like On The Jellicoe Road, or This is Shyness -- the reader is thrown in -- to gorgeous writing and unexpected situations -- and the reader has to fend for themselves a little (but don't let that deter you, it was not a brain strain with epic world building, it was easy to slip into). I loved that about this book. It just launches straight in and gradually things are revealed, and it’s beautiful and amazing. It’s a visually stunning story (in my mind's eye) and totally haunting. There’s layers and depth, characters to care about (fabulous loyal and brave friendships with some enigmatic romance and swoon), and hard-hitting emotions that took my breath away. This book is my sleeper hit of the year. Gorgeous and evocative and Aussie (that outback vibe!) and creative and original and harrowing just completely unexpected. The ending blew me away. I loved it. Everything about it. What a stunning review, Nomes! You so eloquently wrote about this book. I totally missed it, now I have all intentions to read it soon.